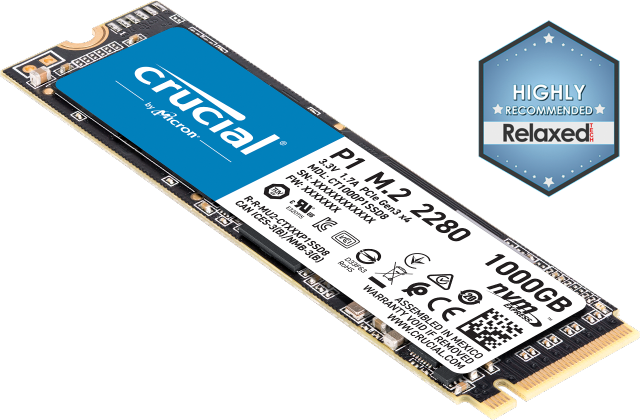 The Crucial BX200 SSD is a legacy product and is no longer available. Ever start your computer, then have to find something to do while it wakes up? Your computer should be ready when you are – not the other way around. Make long wait times a thing of the past by loading apps in seconds, booting up almost instantly, and accelerating nearly everything on your computer. Get more done and have more fun with the Crucial BX200 SSD. Accessing your data on the Crucial BX200 is like flipping a light switch – it’s almost instant. The Crucial BX200 delivers true 540 MB/s sequential reads on both compressible and incompressible data, which allows you to access files and apps almost as soon as you click on them. Stop pulling your hair out waiting for your computer to catch up to you. Life moves fast – your computer should too. Since SSDs access data on cutting-edge flash memory chips rather than on outdated spinning platters, they consume significantly less power than hard drives. Enjoy the ability to do more with longer battery life and experience a cooler, quieter system. Increase your laptop’s portability, worry less about finding an outlet, and boost your productivity. Since SSDs don’t use moving parts that wear out over time, your photos, music, videos, and everything on the drive is less susceptible to a crash. Dropping a laptop with a hard drive may damage the small mechanical parts it uses to read and write data, and could cause the hard drive to fail. 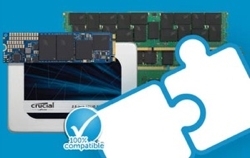 SSDs can sustain more physical trauma since they don’t rely on these mechanical parts. The Crucial BX200 leverages proven flash memory technology that’s been thoroughly vetted and engineered to extensive Micron quality standards. Upgrading to an SSD is one of the best ways to improve your system’s performance, and now the price per gigabyte makes it a great time to ditch your hard drive. Start getting more out of your storage. Performance level based on comparative benchmark scores of the Crucial BX200 SSD and the Western Digital® Caviar Blue™ WD10EZEX internal hard drive. Actual performance level may vary based on benchmark used and individual system configuration. Test setup: 256GB Crucial m4 SSD as the primary storage drive, paired with a 960GB Crucial BX200 SSD and a 1TB Western Digital Caviar Blue internal hard drive as secondary drives (each secondary drive tested separately). All tests conducted on an Asus® Maximus VII Gene motherboard, Intel® i7-4790K 4.0GHz processor, SAPPHIRE Radeon HD 3870 video card, BIOS Rev. 2801, and Windows® 7 Pro 64-bit operating system using PCMark Vantage HDD test suite. Benchmark testing conducted September 2015. Active average power use comparison based on published specs of the 960GB Crucial BX200 SSD and the 1TB Western Digital Caviar Blue internal hard drive.